Wood is undeniably one of the most versatile materials used to achieve architectural balance in a home. Homeowners that partner with an architectural firm in Vail Valley can expect a pleasing selection of interior design elements to create a contemporary, minimalist, modern, or Scandinavian decor. The success of any decorating scheme will ultimately depend upon the right architectural balance of textures and beauty, which TAB Associates can help you achieve in your own home. Natural Wood Interior Trim – Instead of painted wood at baseboards, choose a wood stain that contrasts or blends with the surrounding decor to immediately create visual interest or contrast with a touch of warmth. Chair Rails and Crown Molding – This will break up the areas of monotone, especially in larger rooms such as dining room and great rooms. Either of these wood accents can be used create divisions between different wall colors or textures—such as a transition between a painted surface and wallpaper. Wood Mantles and Built-Ins – Choosing wood for mantles as opposed to stone or brick versions will usher in a traditional feel and add contrast to contemporary decors. Built-in entertainment centers and bookcases which feature warm wood species will help minimize the visual transition. Discover the difference an architectural firm can make by creating a distinct balance utilizing the form, function, and beauty of wood accents. TAB Associates have over 30 years of experience in the planning and design layout of residential and commercial interiors and exteriors in Vail, Colorado. Whether you’re moving into a new home or you simply want to spruce up an old room in your house, a rug is a great way to add a nice touch to just about any room design. Unfortunately, if you’re not an interior stylist, it can be difficult to select a rug that truly suits the aesthetics of a room. Here are a few tips that should help you choose the right rug for your home. When buying a rug, the first thing you should consider is the floor plan of the room. Based on the floor plan, you should choose an appropriate size and location for the rug. Some common layouts for a room include the classic layout, the floating layout, and the dining layout. For example, a room possesses a classic layout if the sofa and chairs are against the wall. For this layout, it is ideal to purchase a rug that is large enough to fit under the front legs of all the sofas and chairs. It may be necessary to rearrange the furniture in your room to achieve the desired look with the rug. You should also think about how much foot traffic the room receives. Different materials offer different advantages and disadvantages. Therefore, the material you decide on for your ideal rug should be based on the type of room the rug is intended for as well as the amount of foot traffic said room receives. Due to low foot traffic, rugs for dining rooms and bedrooms typically don’t need to be as durable. On the other hand, rugs in the hallways should be both durable and dark in color due to high foot traffic. As you may know from experience, choosing the perfect rug for a room can be an ordeal. For more information about room and home design, you should consider reaching out to TAB Associates, an architectural firm in Vail Valley. Stacked stone in a kitchen gives a room character and dimension, and it’s become a popular choice when it comes to remodeling a space. You can buy stone in a variety of textures, colors, and shapes to customize the look you want, though it helps to understand stacked stone and its decorative properties before jumping in. Stacked stone won’t give you smooth, polished walls, but it will give you a multi-dimensional kitchen with real charm. The stones have varying colors, sizes, and depths to create an interesting focal point in the kitchen, and they provide a rustic quality (similar to what you might on the outside of a storybook cottage.) They can be made from a variety of natural elements, such as quartzite, and are roughly shaped like bricks. The color variation of each stone can be high, so it’s important to be on the lookout for stones that don’t fit your palette. Most people use stacked stone in a single part of their kitchen to highlight a specific area. We typically use it to surround major appliance pieces, such as cooking ranges. Decorators will tell you it works best if the stone is set closer to the ceiling to draw the eye upwards, but it can also be used between cabinets or as a backsplash. Under-cabinet lighting can be an excellent way to call attention to the wall, while decreasing potentially dangerous shadows at the same time. Stone will last for quite some time, even when under constant duress, but it will need grout and sealant for reinforcement and protection. If you’re looking for architects in Vail Valley, it’s time to give TAB Associates a call. It’s our pleasure as Vail Valley architects to help you discover the right type of stacked stone for your kitchen. This material is not only inviting and warm, it’s also a lot of fun to style. Let us help you figure out the best route to your dream kitchen today! The wood in your home, such as wood flooring, with the addition of wood furniture, add dimensions of warm colors to any home. Add that to a home designed by a top Vail Valley architectural firm, and you’ll have a beautiful home with rustic charm. It’s important to properly finish your wood decor, especially in the Vail Valley area to keep the architectural balance of the home for years to come. One reason to finish your wood decor is practicality. Wood is porous, which means there is room for dirt, dust, and microorganisms to live. Dust and microorganisms can cause health issues, especially for those with allergies. A quick remedy is to finish the wood in your home. Wood flooring takes on the majority of household activities, and the architects in Vail Valley understand the importance of a high-quality finish with a proper seal. Many do not think about finishing wood decor as a necessity to stabilize the wood material. Wood is naturally unstable because it is able to absorb and release moisture from its environment. As you may know, wood absorbing and releasing moisture will cause it to swell and shrink. Untreated wood swelling and shrinking will lead to splitting, warping and overall deterioration over time. Finishing a home’s wood decor adds natural beauty, color and warmth. Wood has its own depth of beauty unique to each piece that is easily brought out by finishing. From new flooring to an antique piece of furniture, finishing will add a variety of warm colors to your home that easily blends together. Create a gorgeous home effortlessly. If you’re dreaming about a new home, imagine yourself entertaining and relaxing in a home with beautifully finished wood décor. Contact a professional Vail Valley architect today to start making your dream a reality. Want to view more of our work, with luxurious features complemented by a beautiful babbling brook? See this article from Mountain Living. Eclectic is a design style of its own. Usually defined as a style that embraces influences from different eras, cultures and design aesthetics, it can represent a comfortable mix that appears to have evolved over time. In fact, most interiors evolve in just that way: Grandma’s dining room table is pulled into use alongside a newly-purchased china cabinet or buffet, and an inherited, refinished wood coffee table sits in front of a trendy new sofa. Sometimes, however, the mix is a matter of preference and is purposeful and dramatic. Within Vail Valley architecture, the mix of rustic and traditional is especially appealing, as the stunning natural surroundings encourage a variety of architectural expressions. The juxtaposition of sleek and refined with weathered and timeless is always appealing. It’s all about balance. Only in museums is every piece of furniture and architectural trim a similar style. But knowing when to stray from the primary design aesthetic can require a sure sense of what is appropriate. Polished woods and refined color schemes just “ooze” traditional, but even a club chair with traditional lines can be made to feel slightly rustic if you choose a homespun weave for its upholstery. In the same way, a distressed wood floor will feel appropriately elegant in a room filled with traditional furnishings, if you add a hand-woven Oriental rug. If you adore Vail Valley architecture with a hand-hewn vibe, you can still furnish rooms with some fine antiques. Just pick colors and add accessories that complement both designs, perhaps even adding some Native American designs or displaying ethnic themes from foreign travel. That’s the beauty of eclectic design—ignore the rules as long as you have a good eye and keep your eye on quality. If you need advice about balancing your Vail Valley home’s architectural or interior design, why not give us a call today? Bringing the outdoors into your home design is an ideal way to show off your love for nature. Outdoor-themed home elements are particularly appealing during those long winter months when you’re stuck indoors. 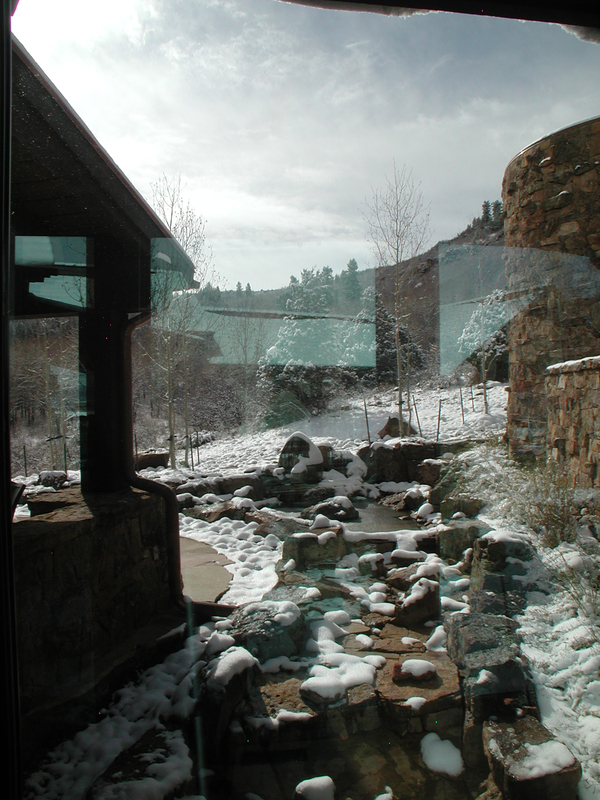 Here are five simple ways to work alongside your Vail Valley architects on using nature as design inspiration. Keep it real with live plants and trees found within your home. There is not a single room within a home that can’t benefit from a potted plant or fresh flowers in a vase. If you have enough open space, take this idea to the next level and use oversized planters to grow a tree or two within your home. Shop organic when it comes to choosing textiles for your furniture and décor pieces. Think wicker baskets, linen couches, hemp area rugs and flax lampshades. For a bolder natural look, choose a talking piece like a stone basin in the bathroom. Adding plenty of natural light to your home can make you feel as if you’re outdoors even when you’re in the comfort of your own home. When designing your rooms select floor to ceiling windows, bay windows and skylights for the most natural light. Natural materials are becoming increasingly popular when outfitting homes. Choices include wood, bamboo and cork. Many of the materials are minimally treated to maintain their natural beauty. Whites are often found in nature-inspired décor items. Ivory cabinetry and furniture are popular choices for those looking to have a beach-themed space. White décor items such as shells, starfish and coral can be added to enhance the aesthetic. Green and blue splashes of color create a contrast with the decor. Schedule a consultation today to find out more about how Vail Valley architects are able to help you reach your design goals. Most interior environments look better during the daytime if abundant natural light is part of the picture. No one likes to spend time in dreary, gloomy places. Following are strategies used by an architectural firm in Vail Valley, CO, designed to optimize natural lighting in the home. The most obvious way to ensure large amounts of daylight is to use lots of glass. However, it’s not quite as simple as just placing as many windows as possible in the structure. Aesthetics such as architectural balance has to come into play as well as the home’s energy needs. For instance, filling up a wall with large, north-facing windows probably isn’t a good strategy in locations that receive significantly cold winters, and the same principle exists with southern exposures in hot climate areas. A skilled designer will take local atmospheric conditions into consideration to ensure that the interior of the home has proper balance. Advances in window-glass technology also offers options not available in the past. For example, southern facing windows in hot desert regions can be tinted to ensure that they don’t cause annoying glare. One of the most important aspects about designing for the optimal use of natural light is to pay attention to balance. Homes where the majority of sunlight is coming in through windows situated on the same wall experience uneven light, and even worse, shadows. Windows, as well as skylights, must be properly located to avoid glaring conditions on the side of the home where the windows are located, and gloom and shadows on the side with no windows. Another important strategy used by architectural design firms is to place windows as high up as possible because the higher the light source, the deeper the light penetrates, which help keeps interior spaces bright. Please feel free to contact us if you have questions about maximizing natural light in the home. You may be under the impression that mixing a variety of wood furniture in a single room will clash. On the contrary, if all your wood surfaces match, nothing stands out and your room can look flat and boring. While you don’t want to go overboard mixing different wood finishes, there are various techniques to help them blend nicely for a layered, more eclectic look that feels natural and balanced. Mixing individual pieces of wood furniture in a room with a similarly toned wood floor causes your furnishings to blend with the floor and not stand out. You’ll make a stronger impact when you purposely contrast and break up these tones. Do this by pairing dark stained floors with lighter toned furniture or light stained floors with darker cherry or mahogany furnishings. If your still in the process of building your home and using an architectural firm in Vail Valley, ask them which wood flooring complements your furniture best. When contrasting isn’t an option, place a buffer between the floor and your furniture by using an area rug. This option also works when the contrast is too different and incongruous to complement each other. Rugs can create a nice transition and soften the overall effect. Mismatched wood finishes can quickly get out of hand. You can create continuity by tying all the pieces together with matching accent colors. Curtains, lamp shades and throw pillows in the same color work well to make individual pieces blend harmoniously and flow together. The more you understand your wood’s unique characteristics, the better you can achieve a complementary blend in your décor. Some of the most interesting rooms include varied wood tones that add character to your home and Vail Valley architects understand the importance of balancing various wood finishes. We can help you find your balance. Call us at 970-766-1470 to start designing the home of your dreams. Please visit this blog for a very interesting view into hanging art in a room. Is An Open Floor Plan Right For You? Open floor plans are one of the biggest trends being requested at Vail Valley architects today. Just as the name would imply, an open floor plan is one that makes several small rooms into one large one. Most commonly, people request that their architects create an open floor plan with the kitchen, dining room and family room all being combined into a single large area. There is no doubt that open floor plans are all the rage today — but is this type of floor plan right for your next home? Ask yourself these questions to find out. Does Much of the Socializing Happens in the Kitchen? Many families say that the majority of their family time and general socialization time is done in the kitchen. This often happens because the people who do the cooking want to be involved in the conversations, and everyone tends to gravitate towards wherever the cook in preparing a meal. If this happens in your family, an open floor plan may be perfect for you. You can wash the dishes, cook dinner and clean the kitchen all while chatting with the family and keeping an eye on the kids. The kitchen is considered the heart of the home. If you love to entertain, there is no better option than an open floor plan. Rather than having small segments of people scattered all over the home, in an open floor plan people can mill around freely. As a host, you can keep up with all the guests every easily this way, too. Everybody is within your view at all times, and nobody will feel isolated. Looking to create a new home with an architectural balance unique to your needs? Whether you want an open floor plan or an entirely different concept, TAB Associates can help. Give us a call to start planning your next home today! Posted on July 6, 2016 August 11, 2016 Author adminCategories Architectural Trends, home, Interior DesignTags home design, home renovation, Open floor planLeave a comment on Is An Open Floor Plan Right For You?